An article published in the journal “Nature Astronomy” describes a research into the possible migration of the orbits of the 7 planets of the ultra-cool dwarf star TRAPPIST-1’s system and their composition. A team of researchers from Arizona State University (ASU) and Vanderbilt University put together the information available on that system to perform a series of calculations concluding that the planets formed much farther away from their star from their current positions and that some of them have a very high water content, paradoxically too much for them to be habitable. The confirmation that 7 rocky planets orbit the ultra-cool dwarf star TRAPPIST-1, announced in February 2017, made it the most studied system with particular attention to the possibility that there’s liquid water on the surface of at least some of them. The repeated observations of those exoplanets’ passages in front of their star provided a lot of data thanks to the fact that their year lasts a few Earth’s days and this allowed to estimate with increasing precision their masses and sizes. For astronomers it’s become increasingly evident that the planets of TRAPPIST-1 have a rather low average density and this suggests that they have a considerable amount of water. That’s because they’re too small to be mini-Neptunes, whose density is lowered by a very extented atmosphere which greatly increases those planets’ size, far greater than those of TRAPPIST-1. To try to obtain more accurate estimates of the water present on TRAPPIST-1 planets, Cayman Unterborn, Steven Desch and Alejandro Lorenz of ASU and Natalie Hinkel of Vanderbilt University used a software called ExoPlex, the state of the art in the field of mineral physics. As a comparison, data on exoplanets already known in systems close to the Sun were used. The result is that according to the models created, the mass of the inner planets TRAPPIST-1b and TRAPPIST-1c is composed for less than 15% of water. The surprise is in the result of the outermost planets TRAPPIST-1f and TRAPPIST-1g, which are composed for more than 50% of water. Given the distance of the planets, they could be called ice planets rather than rocky. This abundance of water suggests that TRAPPIST-1 planets formed much farther away from their star. This conclusion comes keeping in mind the snow line – also known as ice line or frost line – the distance from a star at which water can freeze and the ice can be part of a planet’s accretion. In this case, the planets are too close to the star to justify the presence of so much water so they probably formed at a much greater distance and then got closer. Stars such as TRAPPIST-1 get dimmer and dimmer over time so the snow line shifts. The estimates of the age of that system are still very rough so it’s impossible to build a refined model of its evolution but its planets might have formed at least at twice the distance of their current one. Water is one of the most sought-after compounds on exoplanets because it’s crucial to support life forms similar to those of Earth. 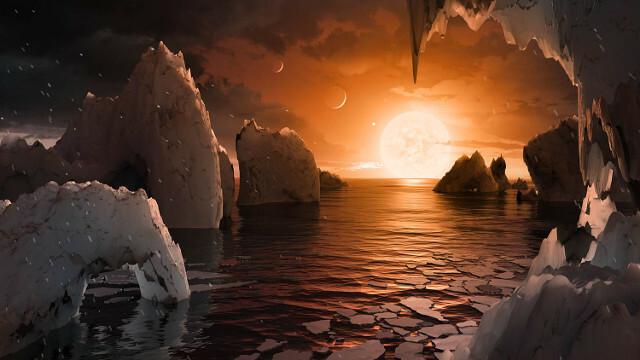 Paradoxically, TRAPPIST-1 planets may have too much of it and be limit cases of ocean planets – also known as water worlds – in which geochemical cycles that are important for the development of life are inhibited by that amount of water. According to this research, the artistic concept of the planet TRAPPIST-1f in the image is perhaps not entirely correct as the surface could be frozen. These results contradict at least in part previous research, which estimated a presence of water up to 5% on TRAPPIST-1’s planets. it would still be a huge amount thinking that water makes 0.02% of the Earth’s mass. If the new estimates turned out to be correct, it would still be an interesting result because it would be a step forward in the understanding of a certain type of exoplanets.